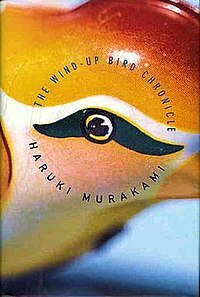 After more than a month of continuous reading, I finally managed last night to read the last 50 pages of Haruki Murakami’s book ‘The Wind-up Bird Chronicle’. Being a big fan of Murakami I’ve now arrived at reading 8 of his books in the last three years. I am so used to his style, but the story always manages to surprise me with every book I read. So here I am, after reading this year 1Q84 and My sweetheart Sputnik. It took me some time to decide to read this book. It’s quite long (about 700 pages) and it’s that kind of book that doesn’t fit in my hand bag so I can read on my way to work every morning. But I made an effort somehow. What I really like about Murakami is how he manages to translate into symbols a rather ordinary and boring life of a human being. What seems to be, at a quick look, a fantasy book showing an imaginary and fantastic story, is actually a book full of symbols and hidden meanings of situations and feelings we meet every day. The Wind-Up Bird Chronicle is a book telling the story of a young married couple. I really empathized with this couple, maybe because they seemed to have my kind of relationship. A couple who develops a high level of trust, who shares the same interests, who develops a link between them that is stronger than being in love with one another. The wife suddenly runs away from home and the husband tries to understand what happened and which is the reason she left him. But to find out her reasons, he first has to search inside him and understand which could have been his actions that made her leave. Also, the wife fights with her inner self, with past experiences that contributed to building her personality, with influences from her family. I would consider The Wind-Up Bird Chronicle a history book as well. There are a lot of passages telling about the World War II, about the fights that the Japanese had with the Chinese, the atrocities the Russians did, the way people died fighting for a lost cause. So for me Murakami strikes again! The Asian literature strikes again! Next on the list : Underground.